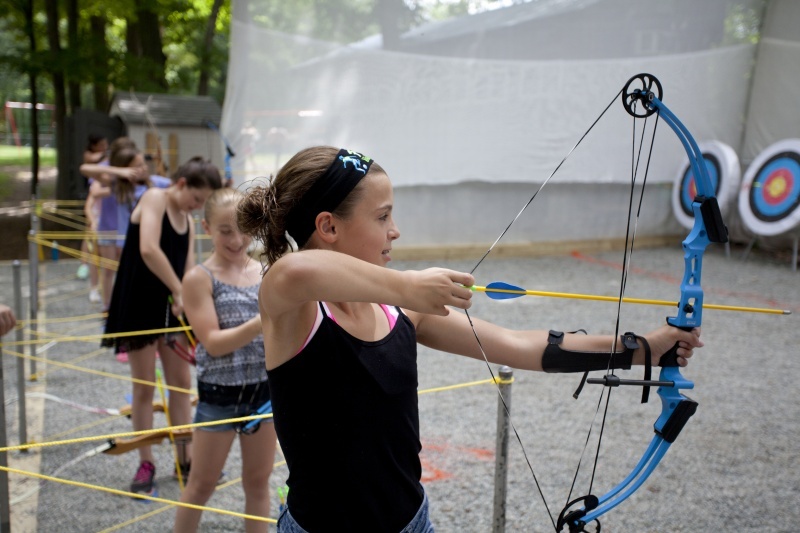 Deerkill Day Camp, celebrating its 59th season under the Rhodes family, is a smaller ACA-accredited day camp that offers a warm and supportive environment on a beautiful 15 acre campus. With a brand-new snack shack and completely renovated bathrooms, our camp looks better than ever. Our group leaders, the counselors who are with your children throughout the day, are mature adults. Deerkill offers a superb swimming program, team sports and a dozen specialty programs in the creative and performing arts. Our campers are from 3-14 and come to camp for a minimum of 2 weeks.Transportation is by air-conditioned minibus. Hot lunches, towels, supplies, trips and a weekend pool club are included. No tipping allowed. A day at Deerkill is different for every camper. Each group has a different daily schedule based on their age and level of development – there is something for everyone! Click on the link below to see your child’s daily schedule and read on to learn more about each of our unique programs. Of course, a summer camp experience would not be complete without field trips and camps shows – please see our full camp schedule at the bottom of this page. Every day is a surprise at Deerkill! Our littlest campers, known as our “Flippers” and “Dolphins,” have a unique program at Deerkill. We give our little ones all of the love and individual attention offered by nursery schools, including licensed teachers, with the activities and excitement of a real camp. They have their own spacious building and playground but most of the time they are off doing the same things that their big brothers and sisters do. Our Flippers and Dolphins have wonderful daily swimming instruction with a 2:1 camper to instructor ratio, free swim, ball sports, and specialty periods in nature, gymnastics, boating, arts and crafts, ceramics, ropes, theater arts and dance. A morning snack, a rest after lunch and an ice cream in the afternoon ensure that our littlest campers have a program that is paced just right. Camp is not just for big folks. A 3- or 5-day program is available. Once campers graduate from our pre-k program, their program broadens to include eight daily activities and lunch. We encourage our junior campers to experience a taste of all that Deerkill has to offer — a well-balanced program of athletics, swim instruction and free swim, and specialty period. Athletics include basketball, soccer, softball/wiffleball, newcomb, kickball, dodgeball and gaga. Our specialty periods include nature, tennis, gymnastics, boating, arts and crafts, woodworking, ceramics, computers, ropes, theater arts, photography, video, yoga, martial arts and dance. As our campers grow older we offer an increasingly flexible program with additional elective periods. For our daily “Club Hour,” campers age 7 and older can choose from among 25 clubs including our athletics and specialties as well as additional choices such as rocketry and remote control boat racing. The rest of their day is a balanced program of athletics, a dozen specialty activities, and twice daily swimming. One swim period is instructional; the other is a recreational swim. For our campers who are 10 to 14, our Quest elective program offers them the opportunity to choose a program that is almost entirely athletic, a program that concentrates heavily in the creative and performing arts, or a mixture of the two. Campers eligible for the Quest program choose one specialty elective per week and work with our professional specialists on a project tailored specifically to their interests. Our oldest campers, known as the “Seniors,” go on a minimum of five day trips each summer. Deerkill prides itself on our “homegrown” staff. Many of our staff are former Deerkill campers who stay at Deerkill to become Counselors in Training (CITs). Our CITs spend half their day assisting our group and specialty counselors while they enjoy all of our regular camp activities the other half of the day. Our CITs join our Seniors on trips throughout the summer. CITs who are ready to advance become junior counselors the following summer. We add to the daily fun with theme days, professional shows, and trips. Campers get to strut their stuff on theme days such as Crazy Hat and Halloween Day. Every other week we invite outside entertainers such as jugglers, magicians and game shows to perform and instruct our campers. And of course we have our annual events including our world-famous Mystery Night, Field Day, and Carnival. All of our campers in our upper camp program (age 7 to 15) go on one age-appropriate trip each session. Be sure to register soon! Some of our programs already have wait lists for certain weeks, and space is limited. Make sure you don't miss out! 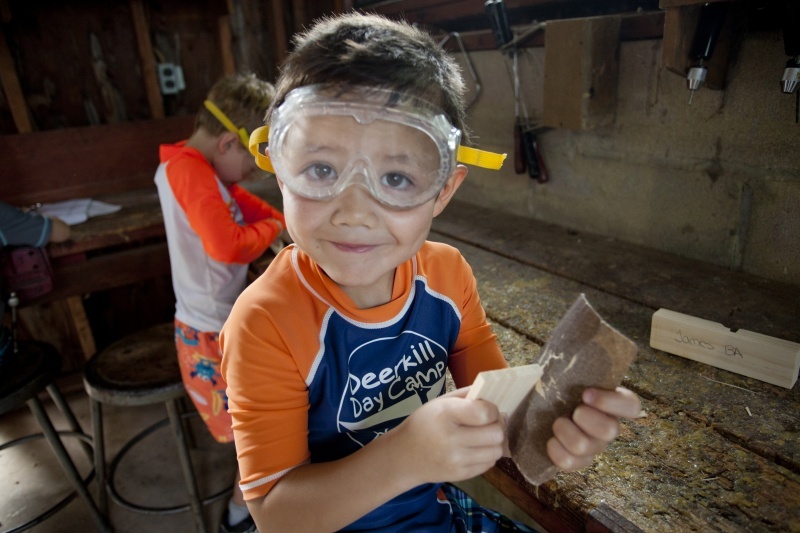 Founded in 1958, Deerkill is a third-generation family-owned and -operated day camp. Bob and Karen Rhodes, daughter Rebecca, and her husband Todd, continue to provide happy challenges to campers in a warm and supportive environment. Deerkill�s superior instruction is the result of an extremely mature staff, with almost half of the counselors being college graduates. Our family looks forward to showing your family around our beautiful wooded campus, which campers have called home for more than 55 years.